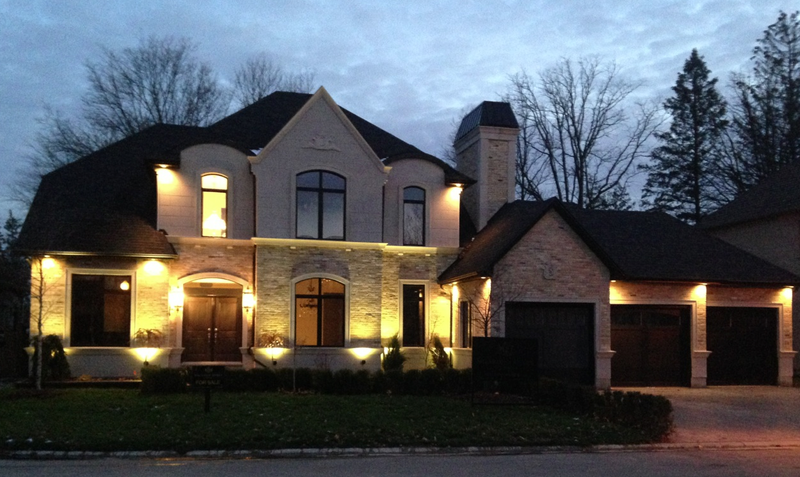 Surrounded by some of London’s most magnificent homes and located in the private cul-de-sac of Broughdale Gates in upper Richmond, this remarkable residence truly stands out with its unique finishes and authentic character.Hundred year-old brick from a church in South London along with custom cast stone trim and blocks adorn the utterly timeless exterior. The pediments were cast from a mould that was designed and hand carved for only this magnificent facade. As with the rest of the interior, no expense was was spared in creating an exterior with character. Everything on the facade is bespoke, from the cast stone trim to the metal chimney top. Stamped concrete drive, walkways and patio ensures maintenance free beauty. The very large garage also impresses with its functionality, a fourth garage door opens to the rear yard.The entry is adorned with a custom designed mosaic made specifically for this project, mirroring the 4 chandeliers hanging over the majestic 2 storey entrance. 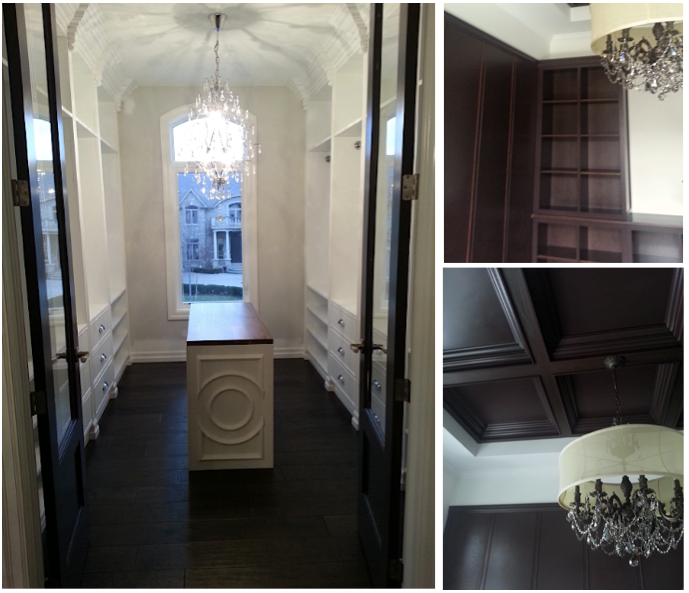 To the left of the entrance an office/den features stained oak built-in unit, wall panelling and coffered ceiling. To the right, a formal dining room, beautifully detailed with moulded trim, wall and ceiling treatments, topped with an impressive crystal chandelier. Tucked behind is a butler pantry and in the main hallway a wide closet with built-in organizer. The main living area surrounds a two-way fireplace with custom floor to ceiling millwork and mother of pearl surround. The multi-purpose mud-room functions as an entry, a laundry and clothing storage. But let’s not forget it welcomes the homeowner, and with its beautiful fixtures, cabinetry and floor to ceiling mosaic, does just that. One of the most opulent spaces we’ve ever designed, this kitchen is truly a space to behold with intricate on-of-a kind cabinetry and extraordinary finishes. A Wolf gas range sits under a walnut mantle with mother of pearl surround flanked by carved, glass doored cabinets. 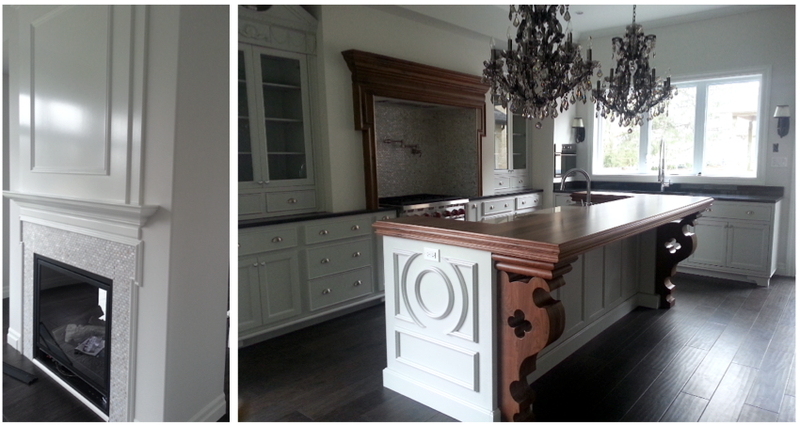 The large two-tiered island is topped with walnut counter on walnut corbels under two crystal chandeliers. A large walk-in pantry with storage organizer hides behind the left door of a solid wood detailed dresser, and a Sub Zero built-in fridge behind the door on the right. Upstairs, each chandelier- topped bedroom features large windows with views of the mature trees in the rear yard. There are two full bathrooms besides the ensuite, each featuring exquisite marble mosaic, full height mirrors and chandeliers (there are a total of 15 chandeliers in this home besides the 40 pot lights). The grand master bedroom with its stepped ceiling features a gorgeous walk-in closet with walnut-topped island. We feel completely justified in calling this en suite a “spa bathroom”. 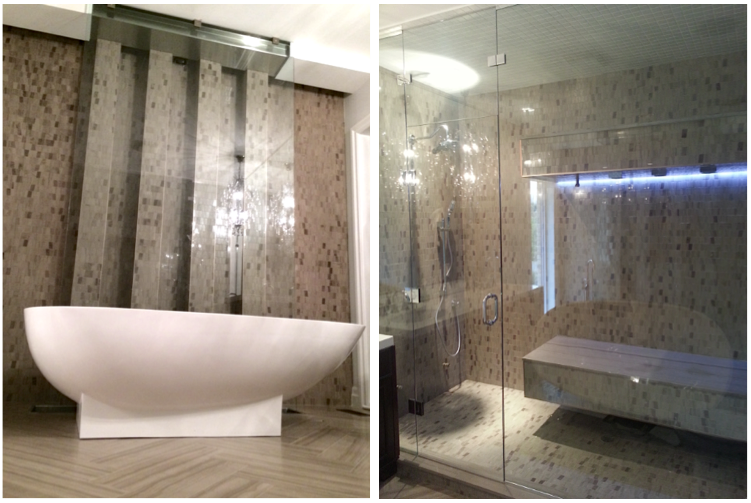 A floor to ceiling glass waterfall frames the freestanding corian tub across from the wall to wall glass shower. The shower features a steam unit, horizontal shower system and heated bench. Details such as ambient lighting and even space to exercise add the final touch to this thoughtfully designed space. The fully finished basement is over 1500sf of space with the same attention to detail and finishes as the rest of the home. A home theatre complete with built-in dual wall speakers (Proficient 125W system), 110″ screen and projector as well as exercise room and large rec room make the basement a great place to be. Oversized windows, luxurious full bathroom, large bedroom and walk-in closet complete with organizers are testament to the same attention given to the rest of the home. As with any other home we pride ourselves in having built, we encourage you to compare the features of this home with any other in its range. We truly believe in building unmatched value along with unmatched beauty. 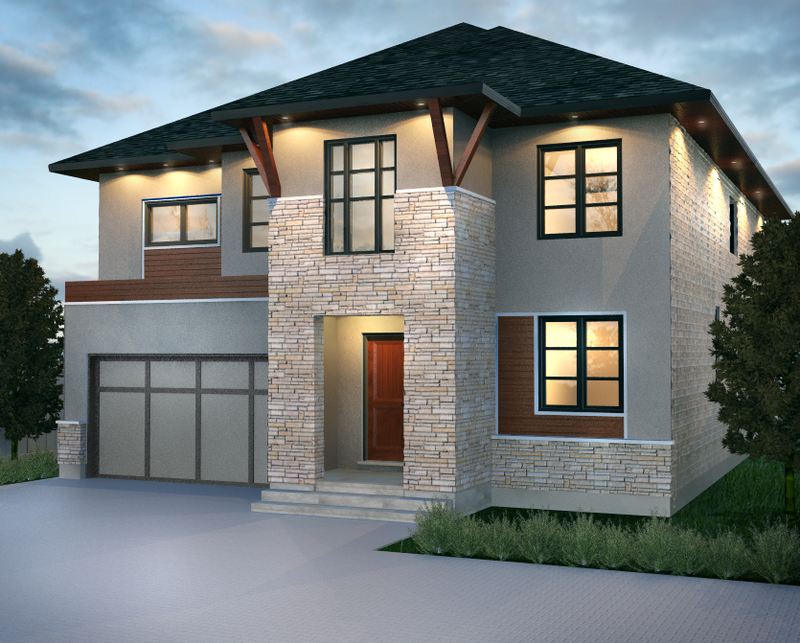 EXTERIORS – Custom cast stone trim & blocks, locally reclaimed brick (2 stories), stamped concrete drive, walkways and patio, fully landscaped. APPLIANCES INCLUDED – (Top models, generally highest capacity) Wolf GR366-Red Gas Range, Sub-Zero 736CI-RH Refrigerator, Dishwasher, Miele Dishwasher, 1.4CF Nutid drop-door Microwave, Front-load 5.0 CF Whirpool Washer, Front-load 7.4CF Whirlpool Dryer, Water Softener, Whole home filtration system. HVAC – Gas range hook-up, Gas barbecue line, HRV system, Humidifier system, 2 way gas fireplace, Programmable thermostat, Heated en suite floor, Heated shower bench. ELECTRONIC SPECS – Cat 5 and cable wiring to every room. Alarm system with 4 motion zones, sensors on all doors and basement windows, touch screen control (with picture frame function). 8 channel sound system with 16 speakers on all 3 levels. Belt-drive, smart phone controlled garage door openers. Complete home theatre system with built in dual speakers, 110″ screen, 1080P BenQ projector. Central vac (top Nilfisk model). USB wall chargers. LIGHTING – 15 Chandeliers throughout, over 40 pot lights throughout, LED exterior accent up-lights, upscale designer lighting throughout. FLOORING – Wide plank engineered hardwood throughout on both floors, Marble, Custom cut mosaic, Berber carpeted basement.